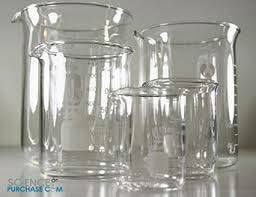 We bring forth a wide range of Glass Beakers, which are ideal Laboratory Containers. They are specially designed for mixing and heating different types of chemicals and liquids. Featuring cylindrical shape and flat bottom, our beakers are available in different sizes. We can also provide Custom-Made Glass Beakers. Contract us to place orders now. We are a trusted name as Manufacturer, Exporter and Supplier from Pondicherry, India.